For 2015 I am having a serious love affair with copper. 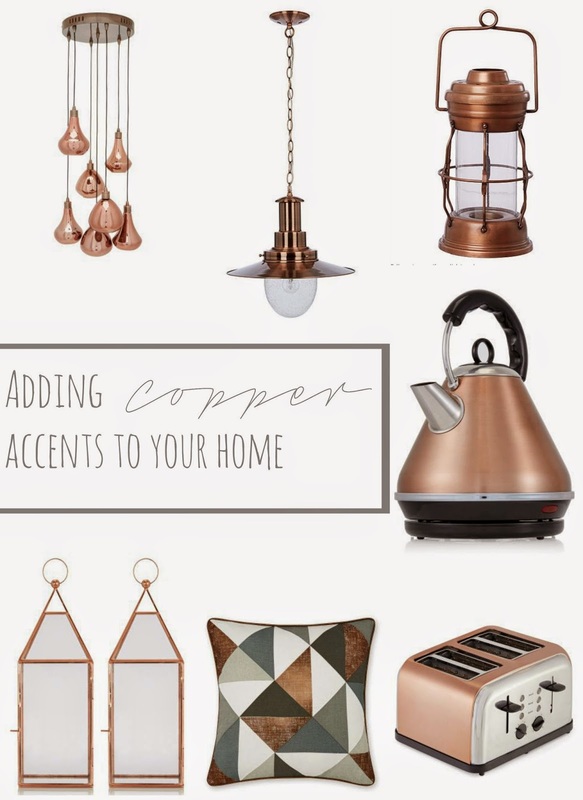 I keep seeing little bits and bobs when browsing and can't help but think how much I need a little bit of copper in my life. I think one of the things I am drawn to with copper is that it seemingly goes with most colour schemes making it perfect for sprucing up and adding something new to a tired room. This latest trend can also be added to every room, but I think it is important to note that with the copper trend you should be careful to not go over board - a little goes a long way! 1. Seven ceiling light (NEXT) £100, I love to see lighting like this, it has something a little classy about it without being too over the top. 2. Alternatively this gorgeous copper and glass seeded ceiling pendent is perfect for the kitchen/dining room - I really love this and only wish my ceiling was a little higher to accommodate it! This is available from House of Fraser and is currently on sale for £80. 3. I love lanterns, but have none in my home so this Fisher mans lantern from House of Fraser, £30, would be the perfect fit - I'm thinking for our main bathroom. 4 & 5. Of course the kitchen can't go a miss from a splash of copper, this gorgeous kettle & toaster (£32 & £35) from NEXT are the perfect touch. 6. For the bedroom or living room, how about these gorgeous geometric copper cushions from NEXT, £12? 7. Again some more lanterns that could be perfect for in a large hallway or living room, these are again from Next and cost £44 for a set of two. I had to be very strict with myself on this post - I could of shared with you about 30 items I love! Are you liking the current copper trend? What's your favourite piece?